What is Jacquard Shedding in Textile? In textile sector, the jacquard is a shed or shedding device which is placed on the top of the weaving loom for producing large figure patterns by using a very large no. of warp yarn separately by means of hooks, needles, and harness cords but without any heald shafts. Each warp yarn can be controlled differently at any pick. The harness is used for lowering or lifts the warp yarn during weaving. No heald frame is used in the jacquard shed or shedding. Sophisticated or large or elaborate design is used for jacquard design. One warp yarn for each harness cords. Min. figuring capacity is 100s- that means min. the number of warp repeat is less than 100. Maximum figuring capacity is the 1800s+ and the maximum number of warp repeat is greater than 1800. By using the jacquard shed or jacquard shedding, the most costly fabric is produced. Single lift single cylinder jacquard (SLSC). The basic principle of the jacquard shed or shedding mechanism is described in the following with the help of single lift single cylinder (SLSC) jacquard. Punches card is used for the jacquard shed which is made according to the design. Here, one pattern card is used for the single pick with these pattern cords. Pattern chain is made which take place on the pattern cylinder. Here, pattern card holes indicate warp up of the design. The knives form the giraffe which is all fastened together. Those are moved down and up from the weaving loom crankshaft. The pattern cards of the perforated cylinder are pressed against the needles when the giraffe begins to move upwards. 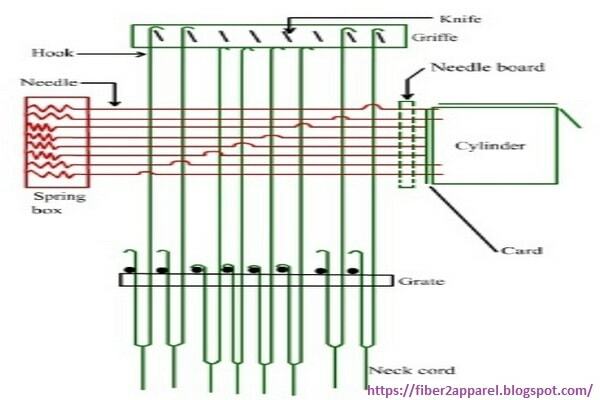 If there is a hole in the pattern cad, the needle directly opposite the hole will pass through it and into the perforation the cylinder and the knife will take if the hook to which this needle is connected and forms the top line of the jacquard shed or shedding. It will press back the hook and as the knife lifts if the pattern card is blank opposite any needle. As a result, the hook is left down. Thus it is possible to lift any of the 408 hooks in the jacquard for any pick and from the bottom line of the jacquard shed or shedding.